Time has passed since the Great East Japan Earthquake in 2011. Reconstruction and restoration work have made progress and the landscape of the coastal areas hit by the devastating tsunami has changed completely.The scene of the disaster is still vivid in our memories. However, those who visit Eastern Japan for the first time have no way to understand the situation right after the disaster. Therefore, we provide 360 degree panorama images that allow you to have simulated experience of the disaster and to perceive the reconstruction at the same time by seeing the present situation. ※We recommend using this content for prior learning or using it on site when visiting areas affected by the Great East Japan Earthquake. Located in the northern part of Kesennuma City, the Shishiori area has many residences and marine product processing factories, all of which were drastically damaged by the tsunami and the fire caused by the Great East Japan Earthquake. A large fishing boat with a length of 60 meters was found in the urban area. Over 1,200 people lost their lives, and over 200 people are counted as missing in Kesennuma City. Raising of the ground levels has been implemented in the entire area in order to redesign both the residential areas and industrial areas. People began moving into Disaster Recovery Public Housing in July, 2016. Minamisanriku Town Disaster Prevention Office is located in the urban area of Shizugawa, Minamisanriku Town. Over 620 people lost their lives, and over 200 people are counted as missing in Minamisanriku Town. At the Disaster Prevention Office, staff called out to the local residents by disaster prevention administrative radio, telling them to evacuate, even as the tsunami hit. Most of the office staff members except some lost their lives as well. Shizugawa Area, Minamisanriku Town, has been redeveloped by elevating the land to ten meters higher than before as a Land Readjustment Project for the Reconstruction of Disaster Affected Urban Areas. The area surrounding the Disaster Prevention Office was turned into a disaster reconstruction memorial park. The office building will be preserved until 2031 under the management of Miyagi Prefecture. Seapal-pier Onagawa is located in the central part of Onagawa Town where the majority of urban areas and communities were damaged by the tsunami. Most of the buildings in this area were completely destroyed or severely damaged. Some of the reinforced concrete buildings collapsed, including the former Onagawa Police Box. Over 610 people lost their lives, and over 200 people are counted as missing in Onagawa Town. Onagawa Town has been implementing reconstruction projects based on the concepts of “visibility of the sea from anywhere”, “creation of beautiful landscapes that attract residents, visitors and make locals proud”, and “town planning that focuses on safety, security and convenience”. They have not built seawalls but have been focusing more on non-structural disaster prevention and risk reduction. Hiyoriyama is located on the mountainous side of the Minamihama / Kadonowaki area in the city center of Ishinomaki. Over 3,500 people lost their lives, and over 400 people are counted as missing in Ishinomaki City. This is the highest number of casualties in all of Miyagi Prefecture. The Minamihama / Kadonowaki area was heavily damaged by the tsunami and the fire, the scars of the fire damage can still be seen on the school building of the former Kadonowaki Elementary School. Ishinomaki City Minamihama Area Reconstruction Memorial Park (temporary name) has been under construction and is expected to be completed in 2020. The former Nobiru Station is located in the western part of Higashi-Matsushima City. Over 1,100 people lost their lives, and 25 people are counted as missing in Higashi-Matsushima City, the third highest number of casualties following Ishinomaki City and Kesennuma City. Most of the buildings located in between the ocean and the Tona Canal were washed away. Even on the far side of the canal, many buildings were heavily damaged. At the time of the disaster, an inbound train and an outbound train departed from JR Senseki Line Nobiru Station. One of them made an emergency stop on a hill and successfully escaped the tsunami. The other train made an emergency stop on a plain and got washed away, after the passengers had evacuated to Nobiru Elementary School. The residents who were affected by the tsunami relocated as a group to Nobirugaoka (Nobiru Northern Hills), which is located at a higher elevation and where new urban area development has been implemented. JR Senseki Line Nobiru Station was also relocated to an elevated area, and was rebuilt at Nobirugaoka as Shin-Nobiru Station. The former buildings of JR Senseki Line Nobiru Station and Higashi-Matsushima City Okumatsushima Tourism Information Center have been transformed into the Higashi-Matsushima City Earthquake Disaster Recovery Memorial Hall. 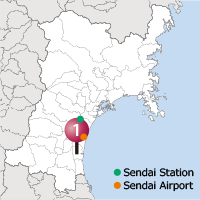 Arahama area is located 10km to the east of the city center of Sendai in the Pacific coast area. There used to be a community with about 800 residences and 2,200 residents, however, the tsunami washed away most of the buildings and caused many casualties. At Arahama Elementary School, which is located in the area, 320 people, including the children, staff members and the local residents, were evacuating when the tsunami was said to have reached the second floor of the school building. Over 920 people lost their lives, and 27 people are counted as missing in Sendai City. Arahama area is designated as a Disaster Risk Area, and any construction of buildings for residential purposes is banned. Arahama Elementary School has been turned into a facility that exhibits information on the Great East Japan Earthquake and Tsunami in detail, and it functions as a tsunami evacuation building. 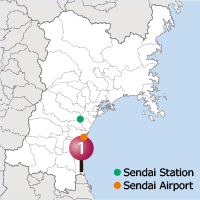 Seawalls and the Teizanbori Canal have been reconstructed and the height of the Shiogama-Watari Road has been raised around Sendai Plains as multiple defenses against tsunamis. The Yuriage area is located on the right side of the mouth of the Natori River. Traffic jams and confusion about evacuation instructions led to a high number of casualties by the tsunami, which also washed away many buildings in the area. Over 950 people lost their lives, and over 30 people are counted as missing in Natori City. Multiple defenses have been implemented by reconstructing seawalls, the Teizanbori Canal and roads. 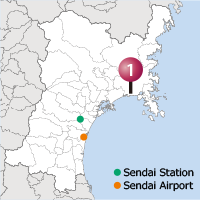 They also elevated the area on the right side of the Natori River, where the damage caused by the tsunami was not as devastating as other areas, to 5 meters higher than before, and have been implementing urban area development including the construction of Disaster Restoration Public Housing. 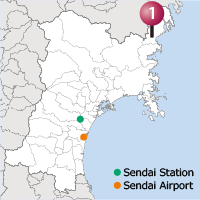 Sendai Airport is located on the border of Natori City and Iwanuma City. 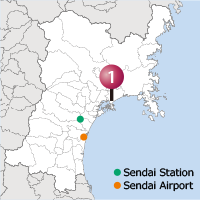 At the time of the disaster, the Sendai Airport Terminal Building accepted over 1,600 people, including stranded commuters and senior citizens from nearby facilities. 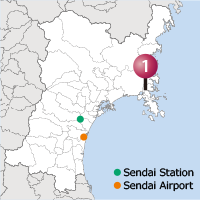 Many residences and factories in the surrounding area were heavily damaged by the tsunami, and the airport was stranded for a day. It was on March 16th when all evacuees were able to leave the airport. Over 180 people lost their lives, and 1 person is counted as missing in Iwanuma City. 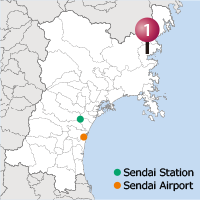 As a method of multiple defense to reduce the power of the tsunamis, Iwanuma City has been constructing seawalls, Millennium Hope Hills, the Teizanbori Canal as well as implementing land elevation of the City Airport Sangenjaya Road. Millennium Hope Hills was named in the hope of happiness for future generations for centuries to come. These hills were made with disaster debris and tsunami soil deposits, and they have emergency tents, disaster-preparedness benches and other items on the hill, so it can be used as a temporary shelter. Torinoumi is located on the southern side of the mouth of Abukuma River. It is an enclosed brackish lake with the Arahama Fishing Port located nearby. The tsunami washed away houses, fishery facilities and fishing boats that were anchored at the port, causing enormous damage to this area. Arahama Elementary School and Junior High School were inundated, and the playgrounds were covered in debris. Over 280 people lost their lives, and 4 people are counted as missing in Watari Town. Watari Town has been reconstructing seawalls, tide-water control forests, artificial hills, evacuation roads, and evacuation buildings, strengthening river banks, and improving disaster prevention radio systems as well as their disaster-prevention education to achieve multiple defenses to reduce the power of future tsunamis. Yamamoto Town is located in the southernmost part of Miyagi Prefecture. At the time of the disaster, all students and staff members of the former Nakahama Elementary School successfully evacuated to the rooftop. Most of the residences near the school got washed away by the tsunami. Over 700 people lost their lives, and 18 people are counted as missing in Yamamoto Town. They are now considering preserving the former Nakahama Elementary School building in order to pass on the knowledge of the damage caused by the tsunami and about the evacuation circumstances as well as to prevent the disaster from being forgotten and to raise disaster preparedness awareness. They have been constructing undulating greenbelts as multiple defenses on and behind the seawalls as a buffer zone to reduce the power of future tsunamis. 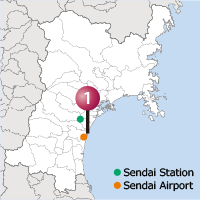 They have also been implementing land elevation of the Soma-Watari Prefectural Road.